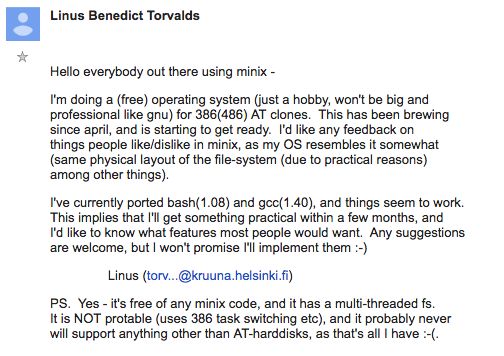 It's been 27 years since Linus Torvalds introduced us to his "hobby" OS. Used be fun back in the early days downloading all those floppy disc images. Was looking at the Linux counter stats for Ireland. ( Statistics about the Linux users in Ireland, IE - The Linux Counter Project - Statistics about Linux, its Users and more ). Only shows 435 users for Ireland but there are many more. Wrong place to start a Holy War. GNU still don't have a stable reliable working kernel (GNU Hurd). There is nothing without that! Both projects came together symbiotically, Linus Torvalds supplying his GPL licensed kernel and GNU supplying key utilities and the compiler and debugger and the GPL software licence. Linux mint is pretty cool but it will never beat windows 3.1 and Dos. Heard Stallman speak about it once. He seemed peeved that Torvalds took all his work (from Gnu services) to complete linux os first. Stallman is a passionate free software advocate, so it was his own doing! His vision of free software - a movement he started - goes even further, a philosophy he maintains Torvalds broke. He's quite a character in person. He is not right about everything and he was eh some interpersonal and hygiene issues. Linux creator Linus Torvalds has apologized for years of rants, swearing, and general hostility directed at other Linux developers, saying he's going to take a temporary break from his role as maintainer of the open source kernel to learn how to behave better. For many years, Torvalds has been infamous for his expletive-filled, aggressive outbursts on the Linux Kernel Mailing List (LKML), chewing out developers who submit patches that he believes aren't up to the standards necessary for the kernel. He's defended this behavior in the face of pushback from other developers, insisting that people being nice to one another was an American ideology. But that may be coming to an end. In a lengthy email posted to the LKML on Sunday night, Torvalds expressed a change of heart. Taken to task over attacks that he recognizes were "unprofessional and uncalled for," he says he now recognizes that his behavior was "not OK" and he is "truly sorry." He's going to step back from kernel development for a while—something he's done before while developing the Git source control system—so that he can "get help on how to behave differently." It's not entirely clear what precipitated this change, though Torvalds did mention a little of the backstory. The Linux Maintainer Summit, an invitation-only gathering of around 30 core Linux developers, takes place each year to provide a venue for kernel maintainers to discuss issues around the kernel's development process. This year's summit was due to be in Vancouver but was moved earlier this month to Edinburgh after it turned out that Torvalds had mistakenly booked a vacation in Scotland that clashed with the Vancouver event.